The event was run on Best Coast Pairings but was cross-posted to Lotus Pavilion. It looks like Cascade are going to be using BCP going forward so if you’re heading to a US event get registered on their app. Total attendance of 65 people which as disappointing considering the 200+ the event had last year. Some have attributed it to the post-hype second year of a LCG, others have pointed to the Friday start, either way I’d have hoped for more. The event had a significant number of Crane and Scorpion participants which seems a clear consequence of new Hatamoto process. Where before top Lion could play for top Lion, now all they can do is farm koku from losses for the prize wall. The attendance includes 1 Dragon and 1 Scorpion who it seems registered but didn’t play. To qualify you needed 43 points after 6 rounds which essentially is 5 wins. Only 8 made the cut with the next 8 added to make the bracket of 16. The two Dragon that did qualify were Aneil and Arash with the remainder going 3-3 at best. 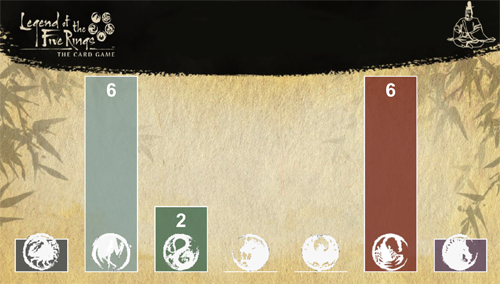 Crane and Scorpion proved strong choices with over 1 in 3 players of each clan making it to day 2. The Crab and Unicorn players were 14th and 16th making it to day 2 with a 4-2 record. 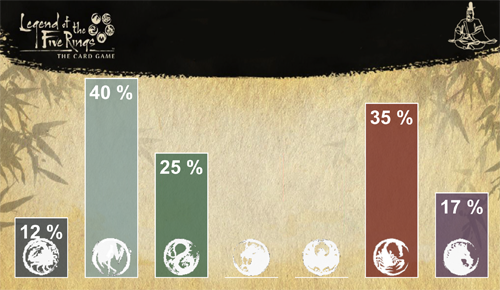 As the event is relatively small and heavily favours Scorpion and Crane who are 47% of the field it isn’t very useful. 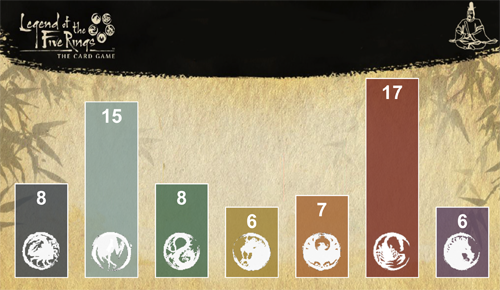 Of the 26 games with Scorpion versus Crane, Crane won 65%. The day 2 bracket can be seen on Lotus Pavilion. Max Williams had a great run taking Crab to top 4. In the end, Aniel beat Erik Stenberg with both getting Hatamoto for the new season. One of the biggest contributors to the disappointing attendance was the short notice given by FFG. The announcement for the next Kotei season came out shortly after worlds which gave approximately three weeks to make travel arrangements in between Thanksgiving and Christmas. I know two phoenix Hatamotos who would have loved to play in the main event but couldn’t manage to get the time off. Any decks for the myriad Crane in the event? Thank you for the article! I would be happy to give you my deck list.